Do you ever look up at the sky, a towering office building, or an expansive landscape and wish your photographs could capture everything you can see with your eyes? This project introduces a digital photography technique called panography. After taking dozens of photos of a scene, you’ll assemble a patchwork of images that more accurately represents what your eyes see when you're not looking through a viewfinder. Panographs are wide-angle pictures composed of many individual photos manually layered together. When these component photos are assembled, they give the impression one would get standing in one place, looking around and unconsciously putting the pictures together in one's head. Go out into the world and find something interesting to shoot. Once you've found something, pick your point of view and make sure you can see everything you want to shoot without moving from your position. Manually set the focus, f-stop, and shutter speed on your camera. This ensures that it doesn't light meter every shot and your photos aren't all differently exposed. Just get a general meter reading and stay with that exposure for all of the photographs that you take of that scene. If you want your panography to consist of many individual photos, zoom in a bit. Shoot. Don't move from your position, but do move your lens in all directions. Try tilting your camera to different angles to soften the straight panorama look. And keep in mind that the more your shots overlap, the easier it'll be to assemble your panography later. Make sure you cover every spot with at least one picture. We tend to only photograph the interesting spots, like lines and busy areas, and oftentimes forget to get the plain areas. Leave a shot out and you'll be left with a hole in your final piece with no way to fill it! Unload your camera and, using Photoshop, resize your photographs to 800 pixels by 600 (or whatever the shorter side comes out to). It's tedious to do this manually for each photo, so to expedite the process, record the resizing and saving of one photo as a new Photoshop Action (see bottom of this page for more about Photoshop Actions). 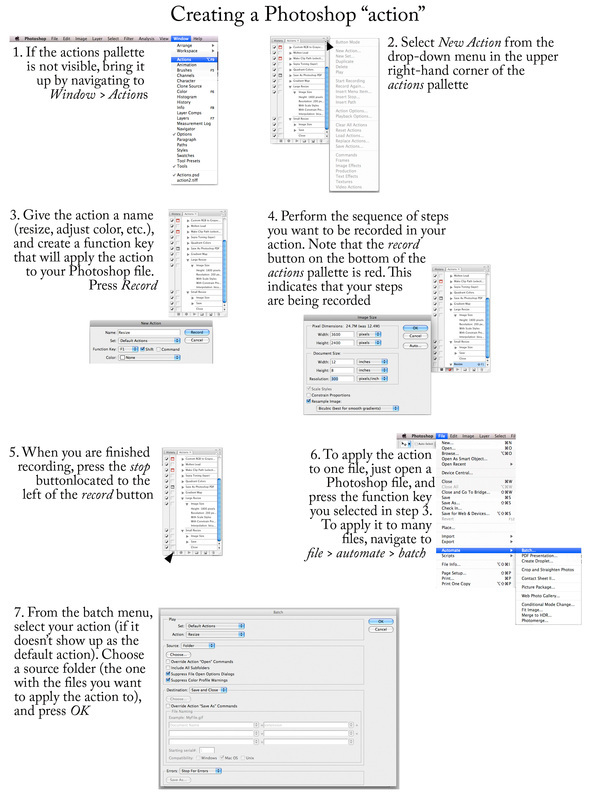 Then go to File > Automate > Batch to select the new action and apply it to your entire folder of panography photos. NOTE: If you want to save the originals, don't forget to duplicate your folder before you resize. Create (File > New) a large (11.7 x 16.5 @ 200 resolution) new RGB canvas to work on. If it turns out the canvas is too small, you can always add some space later (Image > Canvas > Canvas Size). Copy (open in Photoshop, use move tool to drag opened file into new document) the new 800px versions of your images into your canvas--5 to 10 images at a time ought to be manageable. Set the opacity of each photo to about 90%. Using the Transform function (Show Transform Controls should be checked), start moving and rotating each photo to fit the ones next to it. Be careful to make sure you're rotating (you should see a curved arrow tool when you're near a corner) and not distorting the photographs. Now go photo by photo and assemble your panograph like a puzzle. It will take a while to get it right, so be sure to save your work often as you go along. When you're finished assembling the photos together, and before you make final color, contrast, and levels adjustments, we’re going to keep the transparency overlapping look by doing the following: Adjust the “fill” of each layer by selecting and dragging the slider on the layers palette so that the images all have good contrast and color. After this is done to each layer, go back and readjust the brightness/contrast, color balance, and, if necessary, the levels of each layer to compensate for any light images created by adjusting the fill. When everything is complete and finalized, combine all the layers (layers palette arrow > flatten image), and “save as” (last name_panograph_flat). Close original file, don’t save changes.